If you're looking for value garden rollers look no further than our superb range of Turfmaster garden rollers. These towed garden rollers come in a range of different sizes and can be pulled by ride on mowers or garden tractors. We stock Turfmaster towed garden rollers in our warehouse ready to be delivered on a next day delivery service. We stock a wide range of electric lawn scarifiers and petrol rotovators for the seasoned gardener. Buy your scarifier or rotovator from Total Gardens and take advantage of our next day delivery service. Our garden sprayers are designed and built to deal with extensive usage. Our Kingfisher garden sprayers range from 5 litre to 20 litre so there is a garden sprayer to suit every gardener. We specialise in cheap backpack garden pressure sprayers and we aim to deliver next day. If you need a garden spreader why not take a look at our superb range. 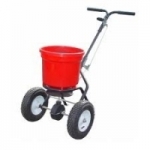 We stock an extensive assortment of Neilson and Turfmaster garden spreaders to suit every budget. Our warehouse is full of Neilson towed spreaders, Neilson push broadcast spreaders and Turfmaster towed spreaders. We also keep a small selection of Neilson towed drop spreaders and aerators ready to ship on a next day delivery basis. If you want a cheap garden spreader come to Total Gardens where quality is standard and next day delivery is our speciality. Total Gardens stock a wide range of Lawn Sweepers to suit most lawn sizes. We specialise in both Push Lawn sweepers and Towed Lawn Sweepers and we deliver our lawn sweepers on a next day delivery. Our Neilson Lawn Sweepers are built to the highest specifications and receive glowing comments from our customers!